JTBC’s first Mon/Tue drama premiered to okay ratings of 2.4%. The following episode showed a slight decline to 1.9% so it’ll be interesting to see how it performs next week. Just Between Lovers is a romantic melodrama about three characters whose lives were changed by a 2005 mall collapse. Lee Kang Doo (Lee Jun Ho) hurt his leg and lost a father who was working on building repairs. He later lost his mother and spends his time working odd jobs to raise a sister who’s currently a medical intern. She works long hours at a hospital where her supervisor thinks it’s okay to reprimand one’s underlings with his fist. I’m sick of watching characters get hit at work. Ha Moon Soo (Wan Ji Ah) builds models for architectural firms. She runs a bath house with a guilt-ridden mother who spends her time drinking away her sorrows as she believes a mother who’s outlived her child has no right to live well. Her child actress/model daughter died in the same building collapse. Moon Soo does her best to keep her mother out of trouble and also struggles with her sister’s death. That fateful day, she’d been assigned as her babysitter during a shoot at the mall but stepped away to meet a guy. She would likely have also died if she hadn’t moved which probably validates her survivor’s remorse. It doesn’t help that her mother also kind of blamed her for it. Seo Joo Won is an architect at a construction firm in charge of building on the aforementioned mall’s site. His father was the lead engineer of the previous building and committed suicide after the incident. He’s now doing everything he can to ensure that the new structure is safe. He hires Moon Soo when she refuses to build a model for an unsafe building and Kang Doo as a spy after he destroys the memorial built on the site. Kang Doo had already been hired as a guard on the site. Although each episode clocked over 70 minutes, it was mainly set-up; introducing us to the characters and how we should expect them to interact in future episodes. The future lovebirds, Moon Soo and Kang Doo have met a few times, including when she took care of him after he got beaten up by thugs working for an employer who ripped him off. Now that they’ll be working in somewhat close proximity, we should expect some antagonism as seen in the preview. Joo Won has taken an interest in Moon Soo and is likely setting himself up for an unrequited love. For reasons not yet explained, following her husband’s death, his mother married her boss and essentially became that household’s unpaid maid. That marriage also ruined the romantic relationship between Joo Won and the girl who subsequently became his stepsister. His sister/ex, Yoo Jin has returned from abroad (the U.S.?) to take over the project and attempt a reconciliation with him. 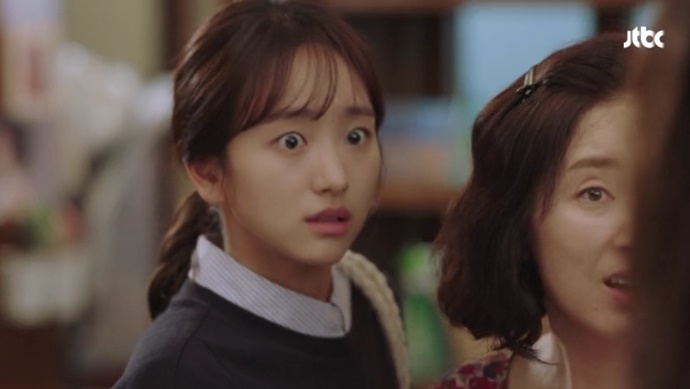 So we’ve got three characters who don’t know that a tragedy connects them (although Joo Won most likely suspects that the other two were affected by it) who will now work closely together, falling in love and any other drama that’s likely to ensue from working on a site that holds many painful memories. We haven’t gotten a lot yet but I’m enjoying it as a slow-moving character-driven story. I like that both leads are regular people struggling with life and that the chaebol isn’t really one. Kang Doo is somewhat self-destructive with his volatile personality but to be fair, so far, he’s only gotten into brawls while fighting for his rights or protecting someone else. He did destroy the memorial so I’ll say that his emotions often get the best of him. Moon Soo has taken the responsibility of being the mediator in the family. As often happens, the loss of their daughter tore her parents apart and although she lives with her mother, she still keeps in touch with her dad. It looks like the plot picks up next week. We’re probably going to get a lot more OTP scenes but who else is getting tired of bosses falling for their employees? Let’s hope that Joo Won only wants to be Moon Soo’s mentor (fat chance!). I do think this is one of the best dramas I have seen. The acting was excellent and I can\’t say enough about Junho. He is so very talented. As far as I am concerned it is not a rom-com. The drama was very addicting for me. I couldn\’t get enough of it. The music was also unbelievable. Kudos to the actors and everyone involved who worked hard to put this wonderful drama together. I am an American woman who loves Korean culture.